When you wake up in the morning, it’s still dark out. Your car is often covered in a layer of frost, and the afternoon hours are significantly shorter as well. You know what that means: winter is on its way. Yet if your winter coat is bulky and unflattering, you may wear it only begrudgingly. With the holidays right around the corner, why not treat yourself to a trendy, chic coat that will keep you toasty and accent any winter look? Here are four great suggestions to get you started. You’ll feel like you’re on the set of Mad Men when you slip into this beauty. The Madewell Swing Coat is blush pink, made of a gentle, structured wool, and covers down to your knees. The pretty pick-stitching and tortoiseshell buttons will keep you looking sophisticated all winter long. If you want a coat that looks like royalty, this Double-Breasted Check Coat from Pringle of Scotland fits the bill. Made of a harvest wool grid, this elegant coat in a lovely tan contrast flannel has a longer fit and also falls below the knees. It’s the large black draped collar that really makes this coat such a standout, though. This one also buttons up at the midriff. Every woman needs to feel like a diva sometimes, and those are the days to bring out the Boma Coat from Sandro. Its quarter-length sleeves and shorter fits means this covers you to your waist, but it’s heavier than some of the other coats above. There’s hidden buttons that don’t interrupt the smooth silhouette. The plush leopard material throughout is utterly chic, and the high collar means your neck will stay toasty all winter long. UK brand Woolrich designed a more traditional winter coat without the bulk. The W’s Scarlett Eskimo 3-in-1 coat is available in dark navy, military olive, or black. It’s made of laminated waterproof cotton and includes feather fill and duck down so no winter chill bothers you. 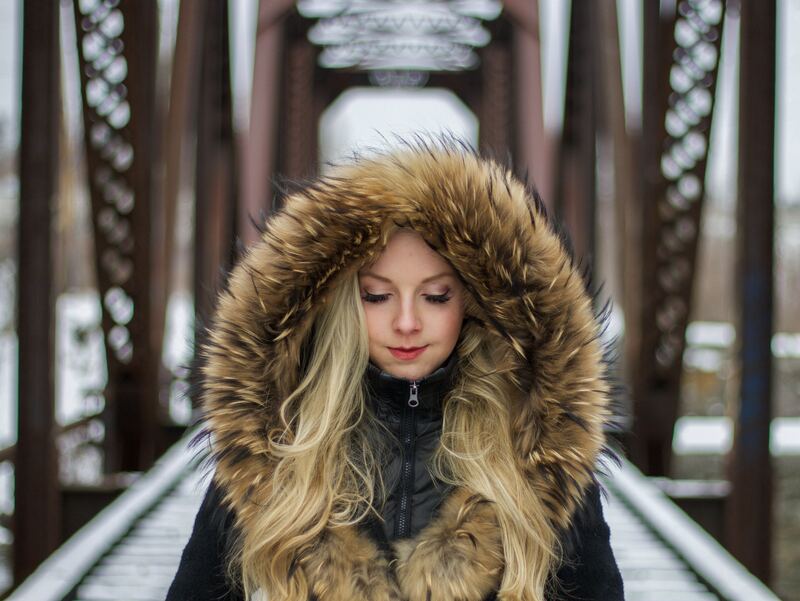 The hood is accented with racoon fur, so when you want to bundle up this winter, you know which coat to reach for!